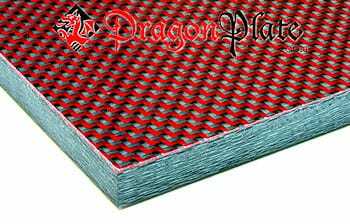 DragonPlate EconomyPlate™ sheets are made in the USA by our skilled technicians. For less demanding applications where you can live without the optimized material properties of a quasi-isotropic lay-up, we have created EconomyPlate™. Our EconomyPlate™ sheets are comprised of orthotropic (non quasi-isotropic) laminates utilizing a twill weave at 0°/90° orientation, while maintaining a symmetrical and balanced laminate. For most sheet thicknesses, we offer a finish on one side of either high gloss, matte or textured and on the other side, a textured finish providing an excellent bonding surface. 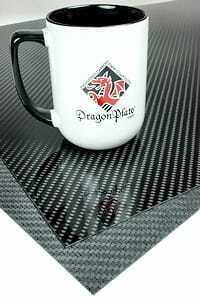 As with all DragonPlate solid carbon fiber sheets, EconomyPlate™ is composed entirely of a tough and rigid carbon reinforced epoxy matrix. CNC machining is also available with EconomyPlate™ solid carbon fiber sheets. Add your choice of a face sheet to one side of an EconomyPlate sheet. Available on 24"x48" and 48"x96" sized sheets in multiple thicknesses. Choose from a large selection of color and weave styles. EconomyPlate Solid Carbon Fiber Sheet ~ 1/32" x 6" x 6"
EconomyPlate Solid Carbon Fiber Sheet ~ 1/32" x 12" x 12"
EconomyPlate Solid Carbon Fiber Sheet ~ 1/32" x 12" x 24"
EconomyPlate Solid Carbon Fiber Sheet ~ 1/32" x 24" x 24"
EconomyPlate Solid Carbon Fiber Sheet ~ 1/32" x 24" x 48"
EconomyPlate Solid Carbon Fiber Sheet ~ 1/32" x 48" x 48"
EconomyPlate Solid Carbon Fiber Sheet ~ 1/32" x 48" x 96"
EconomyPlate™ Solid Carbon Fiber Sheet ~ 1/16" x 6" x 6"
EconomyPlate™ Solid Carbon Fiber Sheet ~ 1/16" x 12" x 12"
EconomyPlate™ Solid Carbon Fiber Sheet ~ 1/16" x 12" x 24"
EconomyPlate™ Solid Carbon Fiber Sheet ~ 1/16" x 24" x 24"
EconomyPlate™ Solid Carbon Fiber Sheet ~ 1/16" x 24" x 48"
EconomyPlate™ Solid Carbon Fiber Sheet ~ 1/16" x 48" x 48"
EconomyPlate™ Solid Carbon Fiber Sheet ~ 1/16" x 48" x 96"
EconomyPlate™ Solid Carbon Fiber Sheet ~ 1/2" x 6" x 6"